There is more than one artist with this name: 1) An American melodic hard rock supergroup that appeared onto the music scene too late to make any sort of lasting impact. The group was formed by brothers, and former Brunette band mates, Johnny (vocals) and Joey Gioeli (guitar). They recruited former Bad English members Neal Schon (guitar, best known for his work in Journey) and Deen Castronovo (drums). Ex Doro and David Lee Roth bassist Todd Jensen rounded out the band. 1) An American melodic hard rock supergroup that appeared onto the music scene too late to make any sort of lasting impact. The group began a major tour with Van Halen prior to the release of an album. The one and only record was filled with classy Americanized hard rock, that showed a harder edge than that of Bad English. Schon, Jensen, and Castronovo took time away from the band to work with Paul Rodgers. However the Gioeli's felt the other members were spending too much time on side projects, and Hardline split. 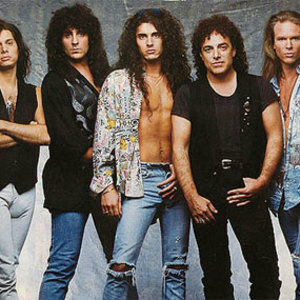 Schon and Castronovo would rejoin Journey in the late 90s, Jensen worked and toured with Alice Cooper while Johnny Gioeli sang on Axel Rudi Pell's Oceans Of Time album. A new version of Hardline consisting of the Gioeli's, Josh Ramos (guitar), Chris Maloney (bass), Bobby Rock (drums, ex-Vinnie Vincent Invasion) and Michael Ross (keyboards) released Hardline II roughly ten years after the debut. With the addition of Bob Burch on bass, Hardline played select live dates with one of those shows being released as an album. Since 1998, Johnny Gioeli has been the frontman for the Axel Rudi Pell band, touring many times over in Europe and performing at the Wacken Open Air festival, a huge metal rock fest held each year outside of Hamburg, Germany. He is known to be one of very few vocalists who can sing in a range that includes melodic rock, hard rock, and metal. The long awaited third album LEAVING THE END OPEN, just released in Europe this April 17, 2009 and will release in the U.S. on May 16, 2009. Hardline are now back from where they have left off with a killer new album. The current line up of Hardline is: Johnny Gioeli, Josh Ramos (guitar), Michael T. Ross (keyboards), Jamie Brown (bass) and Atma Anur (drums). 2) A Norwegian hard rock band active in the early 80's, based in Trondheim. They released a self-titled album in 1984, issued in Europe on the Belgian Mausoleum label.